ITER diagnostics will have access to the plasma through vacuum vessel ports and divertor cassettes (at the bottom of the machine). The contract awarded to IDOM ADA covers engineering services for the integration of the instruments. The European Domestic Agency has awarded a multimillion-euro engineering contract for the integration of diagnostic instruments into ITER vacuum vessel ports. The four-year contract was awarded to IDOM ADA, the Advanced Design and Analysis division of IDOM, a multinational specialized in engineering, architecture and consultancy services based in Spain. 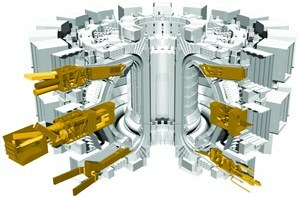 The company will work with instrument designers in several public European fusion laboratories as well as experts in Japan, India, China and the US to deliver a comprehensive engineering design that integrates approximately 20 diagnostic instruments into five of the ports that give access to the ITER plasma. The contract also covers the design of in-vessel metallic containers (weighing 5 to 20 tonnes each) to protect the diagnostic instruments from extreme temperature and to shield other components from neutron radiation. Structures to house the diagnostic instruments that will be mounted onto divertor cassettes will also be designed, as well as specialist flanges to provide water and electrical connections to the diagnostic instruments. "[This is] a clear example of knowledge transfer from laboratories to industry," emphasized Henrik Bindslev, Director of the European Domestic Agency. "Europe's contribution to ITER has been a catalyst encouraging the two poles of knowledge and competitiveness to work closer." Read more on the European Domestic Agency's website.